Death be not proud…nor pretty. Death is sad and scary. I know, I know. It’s the basic truth of the cosmos. That all things must and will pass. And as I’ve crossed the threshold of 40, I should have accepted this by now. But I can’t really. And neither can you. Isn’t that why you watch so many damned horror movies? Death, the fear and loathing of it, is the cornerstone of the genre. And the best horror movies aren’t afraid to go deep and dark into that world where the soft shells we call our bodies are explored like wet meat machines and the many mysteries that lie within are exploited for maximum revulsion and terror. 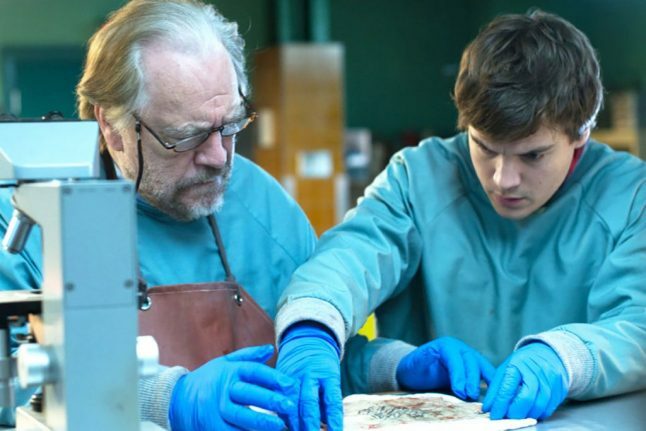 And to be totally honest, André Øvredal‘s new blacker-than-pitch supernatural mystery The Autopsy of Jane Doe exploits the icy, visceral truth of the horror of death better than any feature film I’ve seen since Lucio Fulci rang in the 1980s with a Grand Guignol, rotting crypt and torn flesh bang. The film stars the fine actor Emile Hirsch (Sean Penn’s beautiful Into the Wild) and the great Brian Cox (Manhunter, The Ring) as father and son forensic pathologists who are about to call it a night after a long day doing what they do: cutting dead flesh and breaking lifeless bones and trying to decipher how, why and when their no-longer-breathing subjects have died. Before we get to the thrust of the plot, before the main event promised in the title begins, it’s important to note how carefully and marvelously Øvredal, writers Richard Naing and Ian B. Goldberg and the actors themselves sculpt the relationship between these two men. The dialogue feels real. The connection feels lived in. Tensions and past miseries peek gently around the corners of their exchanges without blowing out exposition insultingly all over the place. This is sophisticated filmmaking, made with style, grace and a refusal to pander to audience expectations. And then Jane Doe shows up. The nameless female in question is a near-perfect humanoid, recalling Mathilda May’s alien “space girl” in Lifeforce. The Sheriff is confounded by his find and insists that the duo cut her open immediately to determine cause of death. What happens next is a slow, unrelentingly scary immersion into real deal horror. Skin is slit open and peeled back. The mouth is pried open to reveal a cut tongue. Damaged organs are expertly removed. Things are found stuffed in intestines. All the while the girl stares lifelessly at the ceiling with her grey eyes and defiantly full bosom and her professional defilers get more and more lost in the impossibilities of her condition. By the time morgue drawers start to creak open and blood flows from refrigerators and clanging sounds emerge from the crematorium, the stoic pair start to accept the fact that something is up. Something bad. Something very, very bad. For its first hour, The Autopsy of Jane Doe might actually be the scariest damn movie I’ve ever seen. Full disclosure: I watched this thing in bed, alone, in the dark. And I was so nerve-shredded that I had to pause it, get up and turn the lights back on. Understand that this never happens to me anymore. I keep hoping it will. And while bumping around Øvredal’s finely-orchestrated nightmare, it did. Oh, boy. Did it ever. Unfortunately, this masterclass in dark, artfully-designed horror filmmaking takes a sharp turn to the pedestrian in its final half hour. Whether the script called for it or a nervous producer demanded it, this beautifully-ambiguous picture settles into definites, with characters jumping to conclusions too quickly and the mounting menace easily explained away in a conventional way. We won’t spoil that final act for you and many people who saw the film already in its festival run or otherwise have been fine with it. It didn’t sit well with me. At all. Because it settles for being just another horror movie when the first 2/3rds are so much more than that. But no matter. Whether you buy the wind-down or don’t, there’s no denying the power of this movie. When it’s on, baby, it’s ON, exploring death, decay and the mysteries of the corporeal and the ethereal better than any other film out there. 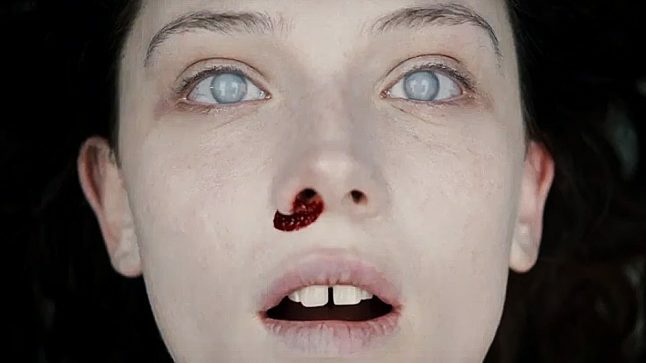 And in this day and age when every horror movie tastes the same and nary do any of them have any lingering effect once the lights go up, The Autopsy of Jane Doe sets the bloody bar pretty high. The Autopsy of Jane Doe is currently playing theatrically in select Canadian and U.S. markets and is available on most digital platforms.